Rolex - A combination I’ve been curious to try for some time. A combination I’ve been curious to try for some time. 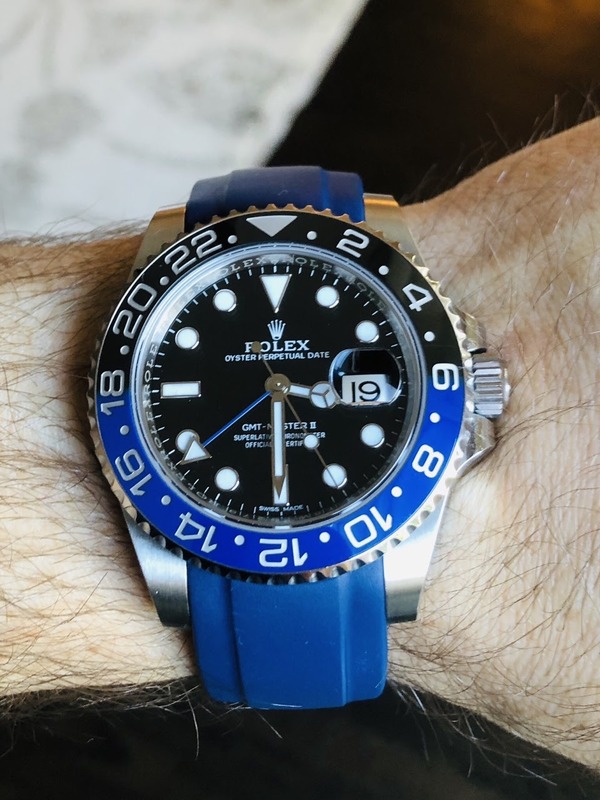 I changed the bracelet on my GMT to this blue rubber one from Everest today after being curious about it for quite some time. After only a few hours so far, I have to say the comfort is very, very good. It’s going to take some more time before I’m ready to make a conclusion on it, but here are some of my early impressions. To me, this change makes it feel more like a tool watch. It’s athletic and certainly more casual. It makes the GMT hand pop more, which I like, but at the same time I feel it diminishes the blue of the bezel because of the lack of contrast. The polished center link of the oyster bracelet on the GMT Master II isn’t my favorite, but I’ve worn it with that for long enough that anything else was going to feel a bit out of place at first. At the least, I think this offers a nice change of pace to the bracelet, but that’s as far as I’m willing to go with it until I have some more time to let the experience sink in. Let us know how comfortable and durable it is. I’d been contemplating it for a while, but had heard some negative reviews. I really like it - looks very different from stock. Was thinking of putting my BLNR on a similar strap. Even toyed with the idea of blue at 6 o'clock and back at 12 - sacrilege? You’re right. It’s a very different look than stock. I like it, but I also like the blue and black of the bezel and how it contrasts off the bracelet. I think it would be cool to try what you’re talking about. A few more pictures in different lighting conditions. This one has really sunk in for me. and to put bracelet back on the watch is easy when ever you want to. I haven’t tried it, but you’re the second person to suggest it. Gym watch. Yes Rolex watches are sure make fr gym activities as well. That Air King looks good! and you may change the bracelet back if you get either bored or tired with that combination. You are absolutely correct. I must say, I’m not thinking of going back any time soon, but’s it’s always nice to have that option. thanks for sharing is it comfy on the wrist ?